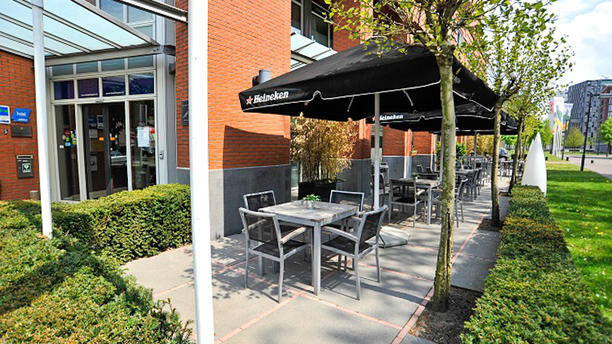 Restaurant Orange is part of Golden Tulip Hotels. As a guest of this hotel you can feast on the breakfast buffet, lunch and dinner. In a modern decor consisting of wooden tables, black chairs and remarkable lamps, they serve dishes with a Mediterranean twist. When the sun is out the terrace is very inviting. Food and drink was top notch - very nice Spanish red wine to start. The aardappel dippers and sauces were great. Hoofdgerechten - kip saltimbocca and ravioli fungi were beautifully prepared and presented. Cheesecake nagerecht was a surprising mix of tastes and textures - delicious and light. Highly recommend Restaurant Orange. Decor and music were very well done. Heel kekker gegeten en een hele goede , attente bediening !